The Sacred Valley of the Incas 15 Km north of Cusco. Called this way to the end of the extensive valley of Urubamba, where the agricultural cattlemen and beautiful towns were concentrated since Inca times. The Sacred Valley is characterized to have very special conditions, as an excellent climate, very fertile lands and the waters of the sacred river of the Inca, The Sacred Valley is embraced between the towns of Písac and Ollantaytambo, it has wonderful landscapes where its inhabitants, native of the Quechua ethnic, conserve many customs and ancestral rites. We will pick you up at the hotel at about 8:20 am. 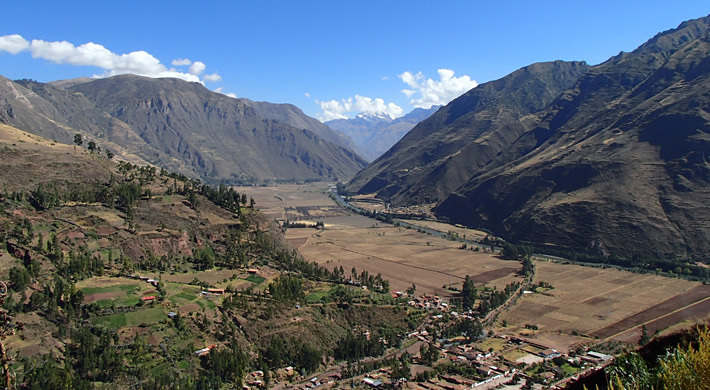 Excursion to the Urubamba Valley, the Sacred Valley of the Incas. This tour is a full day and includes the village of Qorao (where is possible to take beautiful pictures of the landscapes from a lookout site ). Visit to the picturesque Indian Pisac Market held on Tuesdays, Thursdays and Sundays, the shopping paradise of the Andes where barter is still practiced. Enjoy the unique atmosphere during a typical lunch. In the afternoon, passing through the Towns of Calca and Urubamba, we visit the Inca Fortress and Citadel of Ollantaytambo, built to guard the entrance to this part of the Valley, and protect it from possible invasion from the tribes in the Lower jungle. You can walk through the quaint streets of the nearby Town, and get a good idea of what this Strategic Military, Religious, and Agricultural Centre was like during the era of the Inca Empire. On our way back to Cusco we stop of at the picturesque Andean Village of Chinchero to visit the ruins of the Royal Hacienda of Tupac Inca Yupanqui. We will admire a well-preserved Inca Wall in the Main Square, and visit the beautiful Colonial temple built on Inca foundations, with interesting frescoes in the portico. Entrance fees (Half Price For Students With Isic Card).